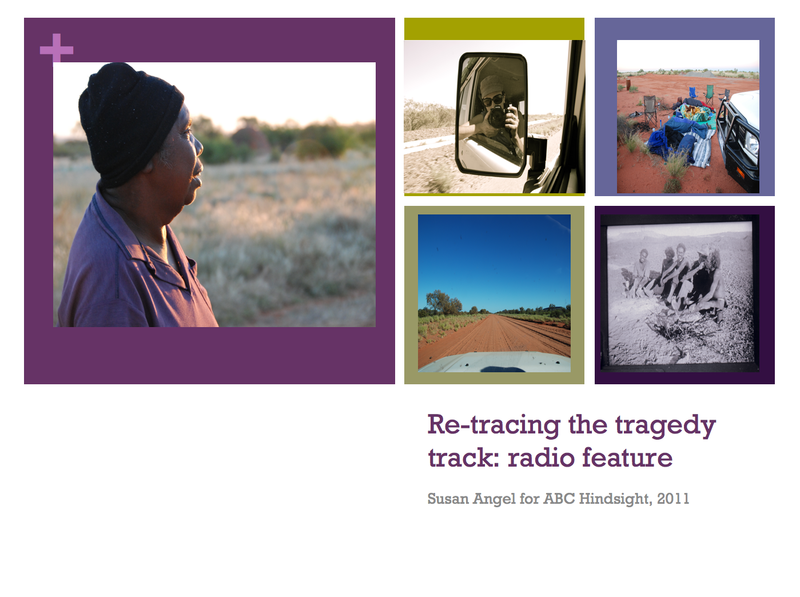 Re-tracing the Tragedy Track documentary (radio) you will find on this site is part of my practice-based PhD (Macquarie University, Sydney). I had the great pleasure of working with Senior elder, Valerie Napaljarri Martin when I worked at Warlpiri Media (now Paw Media) in 1999-2000. Napaljarri was an experienced media producer and a strong Warlpiri woman who moved in with myself and my two daughters when we lived at Yuendumu making us feel very connected to the place and people. I’ve worked with Valerie on several projects since and these are on the site. Besides, Retracing the Tragedy Track, the multimedia piece, Wakurlpa is Valerie’s story of her connection to this special place just outside of Yuendumu. Photographer, Tom Williams and myself spent time with Valerie and her family there to create this short piece for Valerie. This site features quite a bit of my PhD (the written thesis will eventually be linked to this site) and other multi-media work. On this site I’ve also included a multi-media story made with Indigenous women- Mally Smart and Donna Castagna on the south coast of NSW who hold the stories of country still very close to their hearts despite displacement from traditional lands and many upheavals. These brave, beautiful and strong women work with their community to build connections and strengthen the sense of place for all women and children. I was very privileged to spend time with these women and hear the stories of their place. This multimedia was also made with the photography of Tom Williams. As this was part of a community oral history project we worked collaboratively with all the women involved.